…..While we wouldn’t exactly compare the kick in Fireball Whisky to a kick from the almighty Chuck Norris (How dare they! ), we do agree that there’s enough cinnamon kick in this one to ignite a flame in your mouth if you aren’t careful. 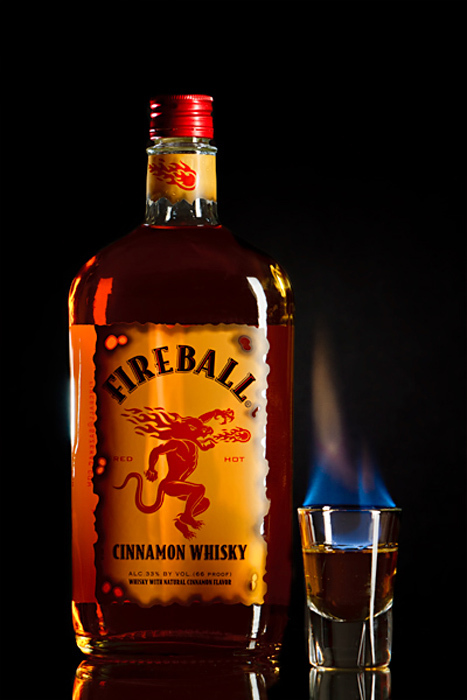 Fireball Cinnamon Whisky comes to us all the way from Canada, originally created to fight off the harsh winters of the North as their website suggests. Coming in at a whopping 66 proof, this whisky actually comes off a bit more like a schnapps, or liqueur. First Impression: I love both the bottle design and logo they created. The yellow and red obviously visualize the fire and flame theme that they are going for. Easy bottle design great for pocketing and sneaking into college parties and tailgating events. As for the aroma: Cinnamon, Cinnamon, and more Cinnamon. Oh and a bit of sugar too. Intense Cinnamon and sugar aromas are the only things I notice when cracking open a bottle. Not a trace of whisky on the nose but that’s not to say it isn’t in there. Taste: Have you every wondered what Big Red Bubble Gum infused alcohol would taste like? Something tells me this is as close as you’ll ever get. There’s an intense cinnamon flavor that immediately hits you followed by a sweet finish with a bit of a bite. Again, not a Chuck Norris bite, but maybe Steven Segal-ish. It actually goes down pretty easy and blends the cinnamon and the whiskey together nicely. While many traditional whisky fans may scoff at this, Cinnamon Schnapps fans will probably embrace it and enjoy the warmer tones the whisky brings out in it. By itself it makes an excellent shot (supposedly it was meant to be consumed in shot form), and in the right drink it can make a nice warm cocktail. Overall: In the past two years this has become one of the most popular shooters in college bars across the country. Younger people like the cinnamon flavor, and it makes for a great shooter and mixer with other drinks. Keeping a bottle of this in the cabinet might be a good idea. Below we’ve shared a few recipes you might want to try with it. Disclaimer: Fireball sample for review was courtesy of representatives of ABC Fine Wine & Spirits. For more information on Fireball including where you can locate it, other fireball whiskey drinks, and more visit FireballWhisky.com. goes very well with RICK SCHLAUCH BEER AND CHIPS!!!!!! !